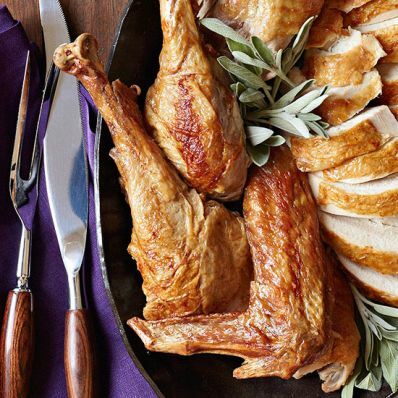 This delicious turkey is easy and uses pantry ingredients you likely already have on hand. 1 of 4 Follow directions on your turkey fryer as to how much oil you will need (we used a scant 2 gallons). Pour oil into fryer and heat as per manufacturer's directions. 2 of 4 Cut off top of head of garlic, so cloves are showing. Place in a small glass bowl and add 3 tbsp water. Drizzle top of garlic with olive oil. Cover with plastic wrap and microwave at 50% power for 6 minutes, checking halfway through. Remove to a cutting board and let cool slightly. Squeeze cloves from paper skin and transfer to a mini chopper along with broth, sage, thyme and 1/4 tsp each of the salt and pepper. Whirl until smooth and herbs are very finely chopped. 3 of 4 Place turkey in a disposable foil pan and remove neck and giblets. Discard or save for another use. Pat turkey dry (inside and out) with paper towels. Pour some of the roasted garlic mixture into the injector and inject into breast meat, thighs and drumsticks of turkey (you should be able to use all the liquid). 4 of 4 Place turkey in fryer basket and carefully lower into hot oil as per manufacturer's directions. Cover and fry turkey for 3 to 4 minutes per pound, until meat registers 165 degrees (it's fine if top of turkey is not immersed). Let oil drain from turkey for 10 minutes. Carefully remove turkey from fryer basket and transfer to a serving platter. Per Serving: 1 g carb., 398 mg chol., 6 g sat. fat, 588 kcal cal., 20 g Fat, total, 446 mg sodium, 0 g fiber, 95 g pro.